Tag Archives for " Enchantment "
Enchantment, according to Guy, is influence on steroids. It’s beyond a transaction and goes to a more permanent relationship. No surprise Guy evokes Apple as a brand that enchants. If you want to enchant someone, it presumes a long term relationship – by definition then, if you’ve enchanted someone you have probably done something that is both good for you and for them and that’s what makes it such an ethical approach. The pillars of enchantment are likability, trust and having a great cause/product. These must go hand in hand – you can like someone and still not trust them. Guy covers the idea of personal enchantment – ala Dale Carnegie. Guy is one of the more likable folks you’ll ever meet. There are aspects of his personality that draw you in immediately and he passes some of this on in this book. Guy evokes Mari Smith’s smile as an element of likability. Dress is important – dress equal to your audience. Just like your dad taught you, a good handshake, including eye contact, may make or break a deal for you. Trust is always a hot topic in business and Guy emphasizes, and I agree completely, that you must extend trust before you’ll be thought of as trustworthy. There are no secrets these days, disclose your interests. You must be a baker instead of an eater. The eater eats and the baker looks for ways to build bigger pies. 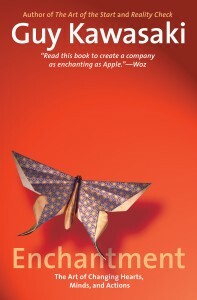 Enchantment is a quick read that allows Guy’s direct and enchanting personality to shine through.